When it comes to football betting, there are countless variations on the same theme that will capture your attention. Obviously the more random the event is that you’re betting on, the more likely it is that you’ll get higher odds. A goalkeeper to score a hat-trick, say, or a specific amount of goals to be scored. A quick look at the ‘Football’ section of a betting website will show you one thing above all else on the main page – Match Betting. These are the odds for each of the three possible outcomes on the game: Home Win, Away Win, Draw. Different bookmakers will display these options in different ways, with one of the most common being the 1X2 format. In that case, 1 is used to represent a Home Win, X is equivalent to a Draw and 2 means Away Win. In the example I’ve posted above, Ladbrokes use the clearer H, D, A alternative. Regardless of the way a specific bookie chooses to format the options, they’ll always be the same and, unless they’re trying to be different to stand out from the crowd, it’s what you’ll always see on the main page. Here I’ll explain how Match Betting works and what you need to bear in mind when you’re looking at the various odds that bookmakers offer. Because this is a ‘special’ bet that was located on the side of the main footballing page, it forgoes the 1X2 or HDA formatting I’ve just told you about. As with both of them, though, the Home team comes first, the Away team last and the Draw sits in the middle. 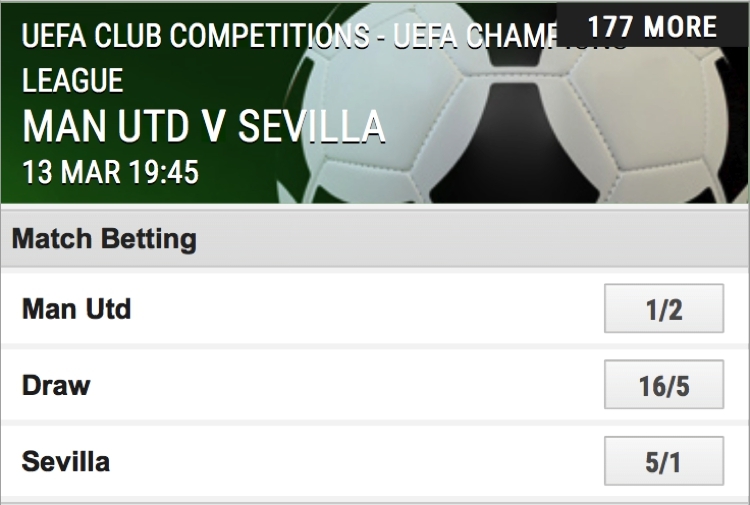 Here you’ll get odds of 1/2 on Manchester United winning at Home, 16/5 on the Draw and 5/1 for an Away Win from Sevilla. There are certain things you need to bear in mind when it comes to placing bets on the Match Betting option. The above example of Manchester United against Sevilla is the perfect place to start, given that the match was taking place in the UEFA Champions League last sixteen. It’s actually the second-leg of the knockout stage, with United having taken a 0-0 draw back to Old Trafford with them from Spain. You’re betting on the outcome of this specific match, which is different from the outcome of the tie overall. The reason that’s important to remember is that you could bet on the Draw, see a final score of 2-2 and wonder why people are talking about Sevilla having qualified and Manchester United being annoyed about the result. The answer is that the aggregate scoreline from both legs in that instance would be 2-2, with the Red Devils being knocked out of the competition because of the away goals rule. Your bet will be a winner because you placed it on the Draw and the match ended in a Draw, but Sevilla will have won the tie overall. It’s worth bearing in mind how the odds change if you opt for this instead of the outcome of the match. Manchester United move from 1/5 to 2/5, whilst Sevilla shift from 5/1 to 7/4. The change in the amount of winnings you’ll get is because your bet now covers the possibility that the game won’t be settled in ninety minutes, meaning that you won’t lose it if the tie goes to extra-time or penalties. Ahead of the 2017-2018 season, the Football Association confirmed that there would be no replays in the quarter-finals of the FA Cup. That means that the match between the Swans and the London club has to be decided on the day. If it ends up being a draw after ninety minutes then it will go to extra-time and the above bets will be settled accordingly. That means that bets on Swansea (Home Win or 1) and Tottenham (Away Win or 2) will be losing ones, and Draw (or X) bets will be winners. If Spurs then go on to win the match on penalties then your Match Bet on them won’t become a winner, however. What Might Dictate the Outcome? There are several things that might influence the outcome of a match and that you can bear in mind before placing your bet. For starters, how is the home form of the team hosting the match? Secondly, how is the away form of the visiting side? Thirdly, are there any major stories regarding the fitness of certain players? Finally, does the referee have a history of any sort? Let’s look at these things one at a time. Some teams play really well at home and have an excellent record, which will influence whether or not you should be placing a bet on them. Say a team has won five out five games against teams in the bottom six of the league, if you’re betting on the sixth match of that run then you’d be foolish to ignore those previous results as they’re indicative of a side that knows how to steamroller the lesser lights of their league. Equally, of course, the home team might have a dreadful home record, perhaps because of problems fans have got with the manager or board, leading to a bad environment for the players to be playing in. In that instance, betting against the Home Win might be your best option. Even the very best teams can struggle on the road from time to time, particularity if you’re looking at a European tie. Arsenal played fifteen away matches between the start of the 2017-2018 Premier League season and middle of March, losing eight of them and drawing four. Despite only being defeated once at home during the same period, the Gunners just didn’t travel well regardless of the opposition. If you were placing a wager on an Arsenal away game during the remainder of that season, therefore, you’d do well to bear that in mind and bet accordingly. Equally, some teams play really well away from home. Liverpool, for example, scored thirty-five away goals and lost half of the number of matches that Arsenal did during the same period. If betting on a match featuring the Reds in their remains games, then, you’d want to look at the opposition’s home form and bet accordingly. Players can get injured at practically any point, with training ground injuries tending to be just as common as those picked up during a match. If a team is missing their main player than it can dramatically alter their chances of winning, so keeping your ear to the ground over such things can help you get one over on the bookies. Looking again at that Swansea versus Tottenham game, Harry Kane picked up and ankle injury during Spurs’s previous game against Bournemouth. That ruled their striker out of the FA Cup match, giving the Welsh side hope that they’d be facing a weaker Tottenham side. If you’d managed to get an ante-post bet in on Swansea as soon as Kane left the pitch injured then you’d have got better odds than when the bookmakers had adjusted them to react to the news, for example. One of the most influential figures on a football pitch can often be the referee rather than any of the players. The interesting thing is that few casual punters bother to investigate the ref or his previous performances when considering Match Betting odds. They’ll look when they’re considering wagers on how many yellow cards will be dished out or whether or not a red card is likely to be issued, but they don’t tend to consider it before placing a bet on the overall outcome of a game. Let’s have a look at my own team, Liverpool. Ahead of our game against Manchester United at Old Trafford, it was announced that the referee was to be Craig Pawson. Pawson, I remembered, had refereed our home match against Everton and given our Merseyside neighbours a very soft penalty late on. He was also in charge during our FA Cup game against West Bromwich Albion in the fourth round of the cup, which was a match using the Video Assistant Referee. He and his assistants gave West Brom a goal that was then ruled out by VAR as offside, before failing to award Liverpool a penalty that VAR helped him overturn. I don’t believe that referees are bias, but you can look at how they’ve refereed previous matches to get an idea about how they might treat the next one. In the match in the Premier League between the Reds and their fiercest enemies, Mr. Pawson failed to give Liverpool a penalty on three separate occasions, in spite of the fact that it was widely considered that they deserved at least one. He also failed to send off Marcus Rashford, despite the fact that the youngster was on a yellow card and jumped into the crowd after scoring, which is an automatic booking. Thankfully I had already done my research on the match referee and had placed a bet on the home side to win, so the man in the middle might have affected Liverpool’s chances of winning but not my bet. That’s the sort of thing that you’d do well to consider yourself when placing a Match Bet. There are another couple of possible bets that you can place when you’re looking at the overall outcome of a match. The first one I’ll tell you about is Draw No Bet. This does exactly what the title of the bet suggests, causing your bet to be void if the match that you’re betting on ends in a draw. Across the five Premier League seasons that took place between 2012 and 2017, around a quarter of them ended in a bet. That means that, roughly speaking, one in four games will end without a clear result if you expand that statistic across all of football. Draw No Bet is a market that removes the draw, meaning that your bet can’t be a loser because the match doesn’t feature a winner. If you bet on the Home team to Win and they do then your bet wins. If the Away team is victorious then your bet loses, but if the game finishes in a draw then your stake will be returned to you. 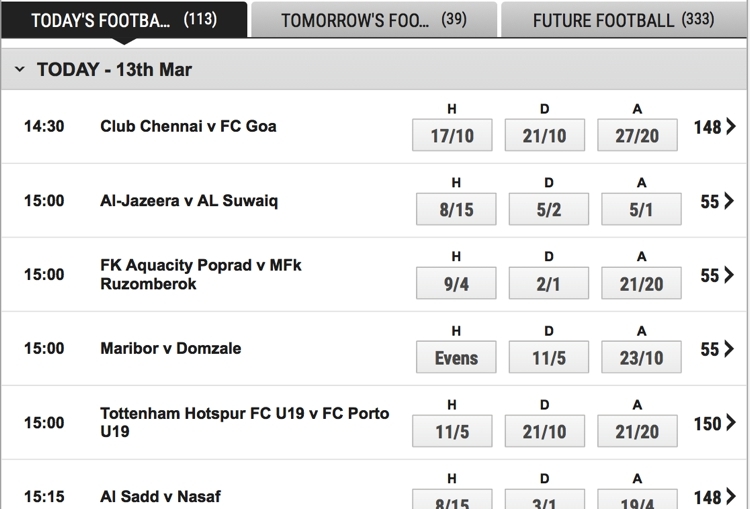 You’ll find the option for Draw No Bet on the main page of bets for a football match; just scroll down until you see it. Looking back at our game from earlier between United and Sevilla, you can see that they change quite considerably when you look at the Draw No Bet market. A Home Win has gone from 1/2 to 2/11, whilst an Away Win has shifted to 17/5 from 5/1. This way of betting allows you to mitigate your risk and is good for risk averse bettors, given that it removes one possible way of your bet becoming a loser. As we’ve just pointed out, however, you do get lower odds than in the standard 1X2 market. You can see that you’re given three different options: Home Win or Draw, Home Win or Away Win, Away Win or Draw. As you’ve probably realised, your bet will be a winner if either of the outcomes within your selection is correct when the full-time whistle goes. Place your wager on the first option, then, and it’ll be a winner if Manchester United win or the game ends in a draw. Bet on the middle option and your bet will win as long as the game isn’t tied after ninety minutes. Finally, place your wager on the third option and you’ll be in the money as long as the Away team wins or the game is a draw. Much like Draw No Bet, the downside of this type of wager is that the odds are dramatically shorter. The Red Devils would be 1/2 if you bet on them to win outright, but by giving yourself the insurance of covering the possibility of the draw too they move to 1/8. It’s the sort of bet that you’ll want to place if you’re fairly certain that the home side is going to win but aren’t 100% convinced. You’ll get less money in exchange for your stake, but you’ll be stopping yourself from losing your bet if your paranoia about the home side not being guaranteed winners turns out to be correct.